I took my first pill of amnesteem today and I am pretty nervous about what will happen in the following weeks and months ahead. 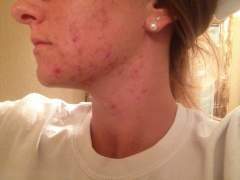 I have heard horror stories and I remember seeing some of my classmates in high school who were taking accutane and how bad their faces got. 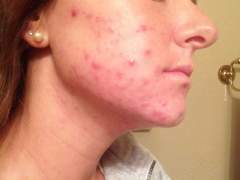 I found this site after visiting my dermatologist to try to get rid of my acne once and for all. He told me he wanted to put me on accutane since I had literally tried EVERYTHING under the sun and over the counter. 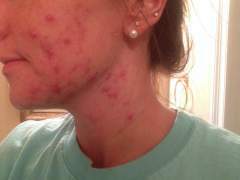 Initially I turned him down and settled for a prescription of solodyne and ziana but when I came home that day to research Accutane I found this site and started reading everyones blogs about how great accutane has been for them and I saw all of the before and after pictures. So, I obviously went back and told him I would move forward with the Accutane. So here we are... Pill one is down and I have 179 more to go! He put me on 40 mg pills once a day and wants to get me up to a cumulative dose of 7050 which should take me about 6 months to complete. 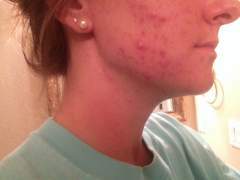 I am 24 years old and my acne started up around 8th or 9th grade which puts me at about ten years of battling it with no success. After graduating from college I had some pretty traumatic stuff happen and then I moved to Florida. I thought being at the beach on a regular basis would help my skin (which isn't the reason I moved to Fl by the way haha) but within the past year of living here my face has gotten worse than it has EVER been. I work in retail too so I deal with customers face to face everyday and I am tired of feeling like my face is a big billboard for acne. It makes me look like a 16 year old too and I do not like that because 16 year olds don't have full time jobs and rent/insurance/groceries to pay for. For once I'd like to look my age and have pretty clear skin. 1. 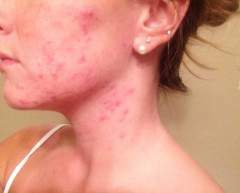 Proactive which made it worse and made my skin very sensitive not to mention bleached my clothes and sheets. 3. 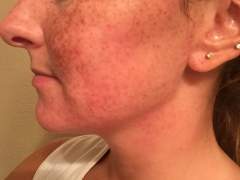 Benzoyl Peroxide... Literally did nothing. 4. Tanning beds and laying out in the sun hoping to dry them up. As soon as I lost my tan the acne would come back. 6. Good old fashioned toothpaste... Never helped just made the skin more tough on top of the acne. 8. 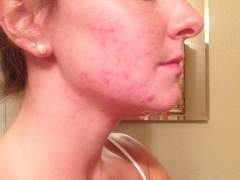 Clarisonic... It made my face feel clean but it didn't help with breakouts and you needed to change the brush a lot too. I could go on for days with stuff I have tried. Which is why I am now trying accutane. 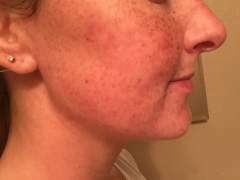 My left cheek has about 4 normal size breakouts and one really bad one on the left side of my chin. My forehead hasn't been breaking out as badly but you can feel little bumps under the surface. I plan to do a flow chart to track my progress over time and I will be taking pictures at least weekly so that I can keep up with what is changing. If anyone reads this and has any words of wisdom/advice/encouragement please feel free to comment! Ever tried birth control pills? I use Tri-Sprintec. First of all, I want to wish you a very good luck with your treatment. I might start as well very soon, I have the prescription but I am still frightened to death!! 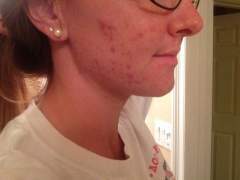 My acne is not what one would call severe but I have been dealing with it for at least the 15 past years!! (I'm 30 years old). And I am so fed up! So I understand perfectly the way you feel. I will follow your progress and I am sure everything is going to be fine for you. 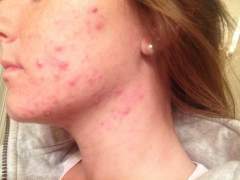 If you are experiencing the initial breakout, just welcome the new pimples remembering they probably are the last (or the worst) you will see on your face.